While there are many aged Wuyi teas around, a really good one is extremely rare and difficult to come by. Our Wu Yi Yan Cha 90s is one such tea. It had been kept undisturbed in a tea storage room for aging for more than 10 years. There is a ancient Chinese saying - "Zang De Shen Hong San Bei Jia". It means that when a tea is stored until the leaves turn reddish, then its value becomes multifold. Aged Wuyi teas are also known to treat cold effectively and was once used as a Chinese medicinal cure for cough and flu. 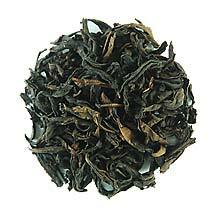 The tea leaves were re-roasted in year 2008 to enhance the fragrance and taste of the tea. The taste and fragrance has a hint of honey-like sweetness but what captures our attention most is how smooth and mellow this tea is. Truly a special tea. The tea leaves are brown in color (signs of aging). Bright amberish infusion.